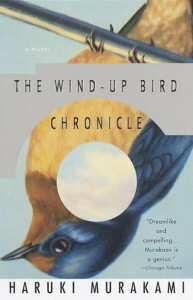 Reading The Wind-Up Bird Chronicle blew my mind. Murakami has a wonderful way of taking regular people in mundane lives and bringing them to live with surreal events. He took such a simple concept and turned it into an intricate web: we cannot escape our past, and we cannot get the most out of our present or future until we are willing to confront our past. He showed this through the struggles of so many of the characters, not just through Toru. Creta wouldn’t face her past, Malta wouldn’t explain her past, Toru’s wife wouldn’t share her past, May wouldn’t take responsibility for her past, and Nutmeg wouldn’t move on from her past. Each one of these characters suffered in their present situation because of how they dealt with (or refused to deal with) the past. Toru’s final experience in the well shows that once he was willing to confront the past, instead of running away from room 208 as he had before, he is able to move on with his life. He experiences injuries during his confrontation, symbolic of the fact that dealing with the past can be painful, but he is then able to see his current situation more clearly and appropriately. Not only is this book a commentary on the past, it also points to the affect of passivity. Toru meets each of the female characters in his life through chance. They come to him either by seeking him out themselves or through chance encounters. It is only when he takes action in the final episode within the well that he frees himself of the static situation his life has become. I felt that the ending of the book was quite satisfying. We never really find out whether some or all of the characters existed in reality or in the parallel universe that Toru experienced. But do we really need to know? We are meant to come away with an understanding of what they experienced and how they affected Toru. Their reality is of little consequence. The vital parts – Toru’s relationship with his wife, for example – are given enough of a conclusion that we can see how important it is for us to confront and embrace the past. What happens afterward (do Toru and his wife get back together?) is not important to the meaning of the story. The wind-up bird is a symbol of the past. It’s crrreeaaak heralds the coming influence of the past, which we can never truly escape. And Mr. Wind-Up Bird is a beautiful microcosm of how the past can creep up on you and break you back down until you are willing to acknowledge it.